Well, are you going to get me outta here? It is not often that I say a dog was lucky to have been dumped at a shelter, but for Athena T., it definitely was a great day for her. Athena has lots of problems, but we are committed to making sure that every day from here on is better than the one before. We are committed to seeing that her life with us is as good as we can make it. 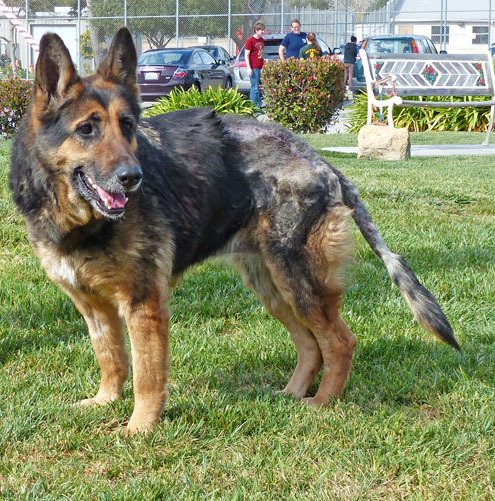 Athena is a cute, perky, petite female German Shepherd who has tons of good qualities. She loves people and greets them all with a really waggy tail. She thinks walks are the greatest, and car rides come in a close second. She has a great smile—I tell people that anyone who doesn’t think a dog can smile has never watched a German Shepherd—hers is brilliant. She is the perfect lady around other dogs. She knows how to use a dog door, and is comfortable in a crate. Athena was brutally neglected by her former owners, resulting in horrendous skin conditions from the middle of her back to her tail. 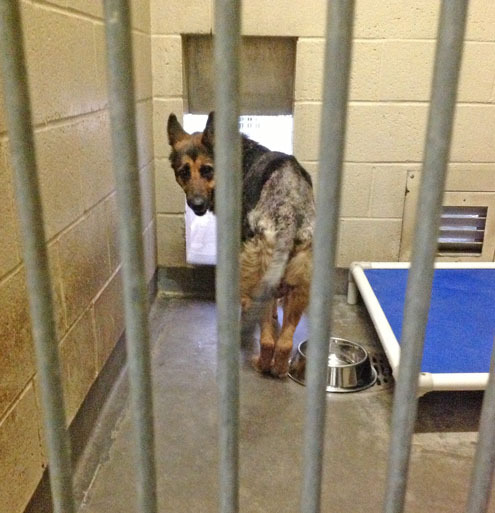 It is just inconceivable to me that someone would let a loving creature like Athena get into this condition. 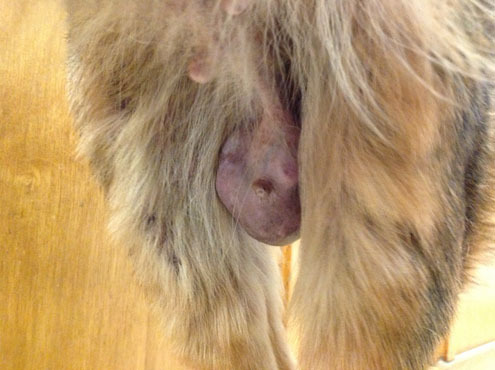 In addition, Athena has a large, pendulous mammary tumor the size of a medium-sized orange. This must have been growing for years without her owners caring. It likely has metastasized to her lungs but we don’t know that for sure. Again, inconceivable to me. And she has other medical issues, but none of them have dampened her spirit. 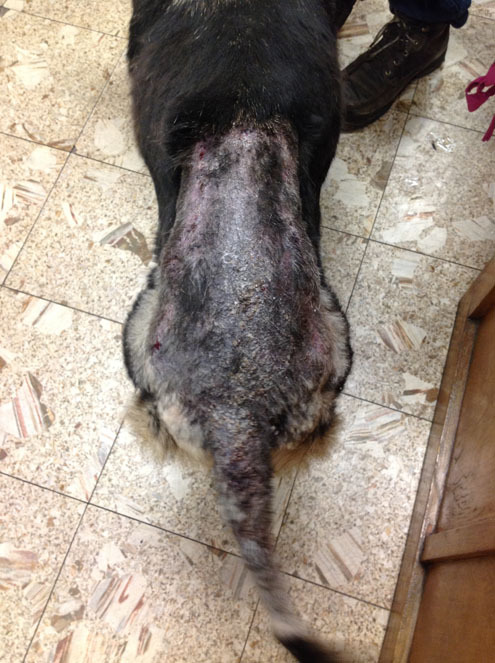 We will immediately begin aggressive treatment of the skin condition, and will remove that large tumor. If the cancer has spread, removal of the tumor won’t cure her, but it will make her a lot more comfortable. We have two other dogs that had similar tumors that we removed—one has been with us for more than a year, and the other is approaching a year. And these are good quality times for both these dogs. So keep your fingers crossed for Athena T., and if you are interested in learning more about her, or possibly becoming her permanent forever foster home, please contact Bob at thulanidogs@gsrnc.org Remember, we cover all the costs for the rest of her life.